After refusing for days to disclose the location of 23 protesters arrested last week and then charged in court, prison officials revealed Wednesday that the group is being held in a notorious jail in Kompong Cham province. 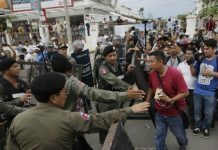 Ten people were arrested on Thursday and a further 13 were arrested on Friday during protests by striking workers that saw at least five people shot dead by military police. Keo Sovanna, chief of Kom­pong Cham’s Correctional Center 3 (CC3), confirmed speculation earlier this week by rights groups Adhoc and Licadho that the 23 protesters—who have not yet been convicted of any crime—are being held at his maximum security jail. “We’ve detained them in the same building [here], since we don’t have the rooms available to detain them separately,” he said. Mr. Sovanna declined to comment further when asked about the health conditions or treatment of the 23 prisoners. The group includes union leaders, activists and striking workers, who have been charged at the Phnom Penh Municipal Court with the intentional destruction of property and intentional violence under aggravating circumstances. Am Sam Ath, technical supervisor with Licadho, said that medical teams from his organization had visited the CC3 prison Wednesday and met with the prisoners. Each member of the group had been beaten both before and after their arrest, he said. “Vorn Pao’s condition is the most serious,” Mr. Sam Ath said, referring to a prominent union leader who heads the Independent Democracy of Informal Economic Association. Chan Soveth, senior investigator at Adhoc, said a team from his organization had also seen the 23 and confirmed all had been repeatedly kicked and beaten. Mr. Soveth questioned why pre-trial detainees had been sent to a maximum security prison hours from Phnom Penh. Kuy Bunsorn, director-general of the general prisons department at the Ministry of Interior, who refused to disclose the location of the 23 prisoners earlier this week, said it was not abnormal that the prisoners had been sent to CC3, which lies almost two hours east of Kompong Cham City. “Under the French, prisoners were taken to Koh Tralach prison where nobody could reach them or see them,” Mr. Bunsorn said, referring to a colonial prison island off Cambodia’s southwestern coast that is today a part of Vietnam.